The situation in the Ukraine follows the same scenario as sundry other states that have been brought into the globalist fold. The riots on the streets of Kiev and elsewhere amount to a “color revolution” of the sought that went like a dose of salts through the states of the former USSR, and recently through North Africa in the so-called “Arab Spring.” Interestingly, there are presently globalist sponsored revolts in three states simultaneously: Venezuela, Syria and Ukraine; all associated with Russian interests. The “Cold War” against Russia as a world power since 1945, after Stalin scotched globalist plans for a world state under United Nations auspices, only had a brief respite during the Gorbachev and Yeltsin years, Gorbachev having since shown his true colors as a globalist. Hence the present crisis over the Ukraine does not represent a “return to the Cold War,” as foreign policy pundits have been claiming; the “Cold War” hardly stopped. The U.S. policy makers have stated plainly that post-Yeltsin Russia remains an enemy and that anyone who aims to reassert Russia as a world power – as Putin has – is a legitimate target of the USA. As we might expect, the Ukraine has been one of the states that is of much interest to the National Endowment for Democracy. One might see from NED’s financial program that here again NED has been avidly sponsoring young cadres in various sectors of society, including “educating” electorates on how to vote in the October 2012 elections. This is flagrant interference in the political processes of what the globalists are now ranting in regard to the Ukraine sovereignty being under threat from Russia. The 2012 NED financial report (the latest published) lists the NGO’s in the Ukraine that received $3,380,834 during that year. The amount represents the upper end of funds sent by NED throughout the world. Veteran globalist foreign policy adviser, Zbigniew Brzezinski, who continues to work at 86 for the Center for Strategic and International Studies, when interviewed by Ukrainian Pravda, a journal connected with NED, lauded the rioting youth that, as with other “color revolutions,” precipitated the present situation in the Ukraine. He has praised their sense of “nationhood,” as “an optimistic sign.” Brzezinski speaks of “independent nationhood.” This praise of Ukrainian nationalism by Brzezinski is odd coming from someone who has spent decades, since his days as a young academic, condemning nationalism and asserting that international capitalism, founded upon a globalist elite that transcends territorial borders, is the next phase of historical evolution in a dialectical process. Brzezinski does not even believe in “independent nationhood.” He believes that it is passé. However it is the line followed by all the other mouthpieces of globalization, including the USA and the E.U., and all the pontificators at the United Nations, who are condemning Russia and upholding this “Ukrainian nationhood.” None, of course, are champions of nationalism, which they regard as anathema. It is another means of undermining Russia as the primary state that remains in the way of the “brave new world,” or the “new world order” as it has been called. Hence, “nationalism” is only used as a dialectical strategy as part of a globalist agenda. Brzezinski also alludes to what is the real bugbear of the globalists: the fear that Russia will lead a Eurasian bloc which, we might add, would also find allies across the world, from India, to Venezuela to Syria; hence the simultaneous actions against the latter two states, fomented by the same forces that are backing the situation in the Ukraine. Brzezinski, as a principal spokesman for the globalists, talks of an “expansion of Europe.” Brzezinski openly states that the globalists want the Ukraine to be part of the E.U. as the start of a process that will integrate Russia also. He states that this is the wave of the future, and that a Russia-led “Eurasian union” will fail. However, if the E.U. represented a truly independent third force, it would have been targeted as avidly by the globalists as Russia and the previous Soviet bloc. Unfortunately, the E.U. has not emerged as a third force, but as an appendage of U.S. foreign policy, and its position on the p resent Ukraine situation is yet another example of this. From Brzezinski’s statements, we can see why the globalists were so eager to oust the Yanukovych regime, with the prospect of the Ukraine coming closer to Russia rather than opting for the E.U. The Ukraine is clearly an important part of the globalist agenda. Brzezinski refers to Russia increasingly interfering in Ukrainian affairs, yet the interference of NED, funded by U.S. Congress, and other such agencies, is long and pervasive. NED funding for a new “Orange Revolution” includes the rather obvious organization named Aplesin (meaning “Orange”), more formally entitled “Center of Progressive Young People, founded in 2001. Aplesin lists its “international financial partners” as the U.S. Embassy; NED; Freedom House; Polish-Ukrainian Cooperation Foundation; International Relief and Development, another U.S.-based globalist front; Princes Foundation Benefactors Ostrozki Ruslan Kraplych, a Ukrainian based organization receiving funding from Microsoft Ukraine and USAID; among others. The George Soros network of globalist subverters operates in the Ukraine through the International Renaissance Foundation. The Foundation has been active is assisting rioters injured in fighting with authorities. One of the first actions of the regime that ousted Yanukovych was to give Ukraine oligarchs their own fiefdoms. Suddenly, oligarchs have become “patriots” and “nationalists.” Rinat Akhmetov, the wealthiest of the oligarchs, head of the SCM group employing 300,000 people and spanning the entirety of the Ukraine, pledged to defend his homeland – although he had lived at One Hyde Park, London – in the event of a Russian invasion. The previous day two other oligarchs, Igor Kolomoisky and Serhiy Taruta, accepted governorships over two regions and responsibility for preparing defense against a Russian invasion. Kolomoisky, “a prominent member and supporter of the country’s Jewish community,” now heads the regional government of Dnipropetrovsk in eastern Ukraine. Taruta is governor of Donetsk, in the far east of the Ukraine. Another oligarch, Dmytro Firtash, rallied to the cause, “speaking on behalf of business circles.” Rabbi Shmuel Kaminezki, head of the Jewish community in Dnipropetrovsk, expressed his support for Kolomoisky, as the Jewish community likewise finds its Ukrainian nationalist voice. As for Akhmetov, he is said to have had influence over a bloc of forty members of the Ukraine parliament, and one might wonder if it was this influence that was instrumental in the ouster of Yanukovych? Petro Poroshenko, billionaire confectionery and automobile manufacturer, TV channel owner, and former Minister of Foreign Affairs and of Trade and Economic Development, also headed Ukraine’s National Bank (2007-2012). He was a major supporter of the 2004 “Orange Revolution,” and chief campaign manager for Viktor Yushchenko’s Our Ukraine Bloc. Forbe’s recent profile states of Poroshenko that he “was a major supporter of anti-government protestors in the Ukraine.” He is a member of parliament and is considered a likely presidential contender. His business focus is on external markets, particularly in E.U. states, having been excluded from Russia. Perhaps this explains his enthusiasm for Ukraine’s entry into the European market? Victor Pinchuk is second wealthiest oligarch in the Ukraine, behind Akhmetov, and has impeccable globalist credentials. He is founder of EastOne LLC investment, London, a media magnate, and a proponent of Ukraine’s entry into the E.U. His international links include being an adviser for the Brookings Institution, and a friend of former U.S. president Bill Clinton, former British Prime Minister Tony Blair, and globalist wire-puller George Soros. He founded the Yalta European Strategy (YES) to promote Ukrainian entry into the E.U. The stated aim of YES is to integrate the Ukraine into “key international systems.” The Pinchuk Foundation is associated with the Open Ukraine Foundation, which focuses on youth leaders. Open Ukraine was founded by Arseny Yatsenyuk, Minister of Economics (2005-2006), Minister of Foreign Affairs (2007), and chairman of the Supreme Council (2007-2008). He headed the Front for Change party (2009-2012), and during the last half of 2012 headed the “United Opposition,” also known as the All-Ukrainian Union Fatherland. Co-founder of Open Ukraine is Dzhymala Zbigniew, director of the financial and industrial group Inter-Groclin. Pinchuk is a member of the governing body of Open Ukraine. Other O.U. luminaries include corporate board directors such as Roman Speck, CEO of JSC Alfa-Bank. Association with the Front for Change party is continued through party leader Svetlana Wojciechowski. “Partners” of Open Ukraine include the Victor Pinchuk Foundation; the veteran globalist think tank Chatham House; Black Sea Trust for Regional Cooperation (BST), “a project of the German Marshall Fund,” a U.S. entity founded in 1972 to promote “Atlantic relationships,” “in the spirit of the Marshall Plan; NATO Information and Documentation Center; “Democracy, Public Affairs Section,” U.S. Embassy in the Ukraine; International Renaissance Foundation, the Soros Open Society front in the Ukraine; Embassy of Poland; Horizon Capital Advisers LLC, focusing on investments in Ukraine, Moldova and Belrus. Open Ukraine has made its position unequivocal, proclaiming the “eternal memory and glory of the heroes” involved in the riots causing the present crisis. The Front for Change, with its close relationship with the oligarchs and globalists, merged into the All-Ukrainian Union Fatherland in 2013. The Fatherland Union, or United Opposition, traces its origins to the 2004 “Orange Revolution.” What is being played out in the Ukraine now is the attempt to complete what was attempted in 2004. Arseny Yatsenyuk has been appointed interim Prime Minister. An article in Forbes calls Yatsenyuk “Washington’s man.” Correspondent Kenneth Rapoza alludes to a leaked phone call where Victoria Nuland, U.S. Assistant Secretary of State for European Affairs, told the Ukrainian ambassador that the USA wants “Yats” in. “Yats” was elected by the Ukraine parliament, with just one dissenting vote, despite previously being behind other opposition leaders as choice of prime minister, because he “had friends in high places and while he does not have strong support of the electorate, and would have no chance of winning an election, he is pro-IMF austerity and apparently the bulk of parliament is as well.” Yatsenyuk’s most immediate measure is to secure loans from the IMF and U.S. and E.U. banks. 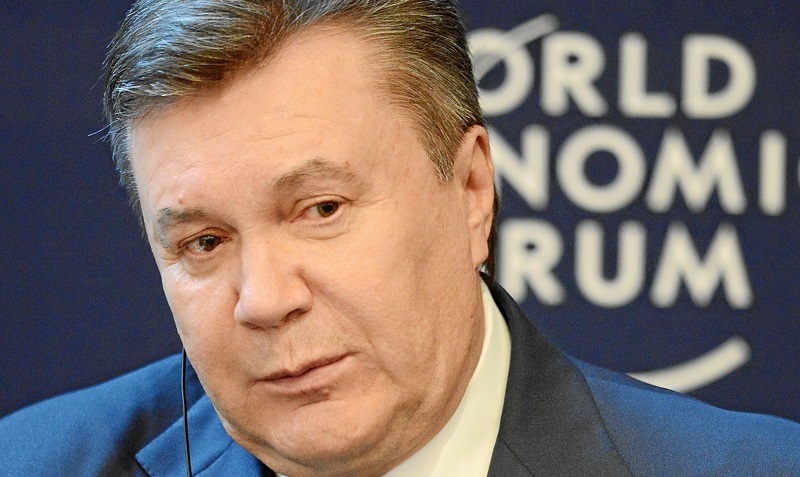 Yanukovych resisted IMF demands to raise taxes and devalue the currency. Indeed, Yatsenyuk had stated that talks with the E.U. and the IMF are his top priorities. An IMF team arrived in the Ukraine on March 4, Yatsenyuk having stated just prior to the delegation, that Ukraine would meet all IMF requirements. The IMF had suspended loans to the Ukraine twice since 2008 because of the failure to carry out IMF policies. In December 2013 the IMF and the Ukraine failed to reach agreement in talks. The new government under the oligarchs has pledged to the IMF that it would undertake “wide ranging reforms,” according to the Fund’s spokesman Gerry Rice. Yatsenyuk has stated he expects to be the most unpopular leader in Ukraine’s history, indicating that, in keeping with usual IMF demands, the first measures will include cuts in state subsidies, particularly for domestic energy consumption, and welfare. U.S. Secretary of State John Kerry wants to rush through a U.S. guaranteed loan of $1 billion, with the E.U. likely to offer a similar amount. Russia had previously promised $15 billion, an offer that has now been withdrawn. What the outcome will be is predictable: as in other states that have thrown themselves upon the IMF, Ukraine’s economy will be privatized; her resources thrown open to global predators, and the Ukrainian Nationalists, who are already at odds with the social democrats now running the Ukraine, will have provided some of the street fodder for a process that will see the Ukraine enslaved not to Russia, but to global plutocracy – unless Russia stands firm. K. R. Bolton, Stalin: The Enduring Legacy (London: Black House Publishing, 2012), 125-139. K. R. Bolton, Stalin, op. cit., 137-139. Note that Leshchenko, who conducted the Brzezinski interview, is a NED Fellow. Zbigniew Brzezinski, Between Two Ages: America’s role in the technotronic era (New York: The Viking Press, 1970), 29. K. R. Bolton, Geopolitics of the Indo-Pacific: emerging conflicts, new alliances (London: Black House Publishing, 2013), 174-180. In December 2013, the Foundation was calling on the USA and E.U. to freeze the bank accounts of the “Yanukovych regime.” The sponsors of the Foundation include the Charles Stewart Mott Foundation, E.U., and NED, among others. The stated purpose of the Foundation, founded in 1999, is to make the Ukraine into a “market economy,” “to integrate the Ukraine into Euro-Atlantic structures,” based on the experiences of Poland, and to involved the Ukraine in fomenting regime change in Russia and former Soviet bloc states.